Vanessa Redgrave and Terence Stamp go hand-in-hand in Unfinished Song. 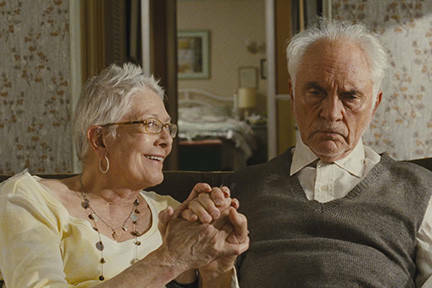 Terence Stamp (The Adjustment Bureau) and Vanessa Redgrave (Letters to Juliet) star in Unfinished Song, an inspirational comedy-drama film about the healing power of music. In the film, Arthur (Stamp), a curmudgeonly old soul, is perfectly content with his reliable daily routine until his beloved wife (Redgrave) introduces him to a spirited local singing group led by the youthful and charming Elizabeth (Gemma Arterton, Prince of Persia: The Sands of Time). Despite his initial resistance, this unexpected friendship leads to Arthur’s discovery of music that revitalizes his passion for new adventures and reconnects him with the people who matter most. Written and directed by Paul Andrew Williams (London to Brighton), the PG-13-rated movie opened to favorable reviews in June, 2013, ringing up a not-bad $1.5 million at the domestic box office. The Unfinished Song DVD special features include outtakes and deleted scenes.